LONDON (Reuters) - Sales at Sainsbury's, Britain's No. 2 supermarket group, have worsened, industry data showed on Tuesday, adding to its woes after a brutal provisional regulatory view on its proposed 7.3 billion pound takeover of Asda. Last month the Competition and Markets Authority (CMA) said its initial view was that the deal should be blocked in the absence of the sale of a large number of stores, or even one of the brands. The CMA will publish a final ruling by April 30. Shares in Sainsbury's, which had fallen by nearly a fifth after the CMA's preliminary report, dropped as much as 1.3 percent on Tuesday after market researcher Kantar Worldpanel said Sainsbury's sales fell 1 percent in the 12 weeks to Feb. 24, reducing its market share by 0.5 percentage points to 15.7 percent. In contrast sales at market leader Tesco, No. 3 Asda, which is owned by Walmart, and No. 4 Morrisons rose 1.3 percent, 1 percent and 0.8 percent respectively, Kantar said. A rival data set from researcher Nielsen recorded Sainsbury's sales decline at 0.9 percent for the 12 weeks. "A very bad period for Sainsbury's with signs it is getting worse," said HSBC analyst David McCarthy. "With the almost certain failure of the Asda deal, these are deeply worrying times for Sainsbury as it is losing share faster than any competitor," he said in a note. He highlighted that Sainsbury's sales are in decline on a one- and two-year view despite overall market growth. Analysts at Jefferies said the data depicted "a fairly extreme underperformance of other UK grocers" by Sainsbury's. 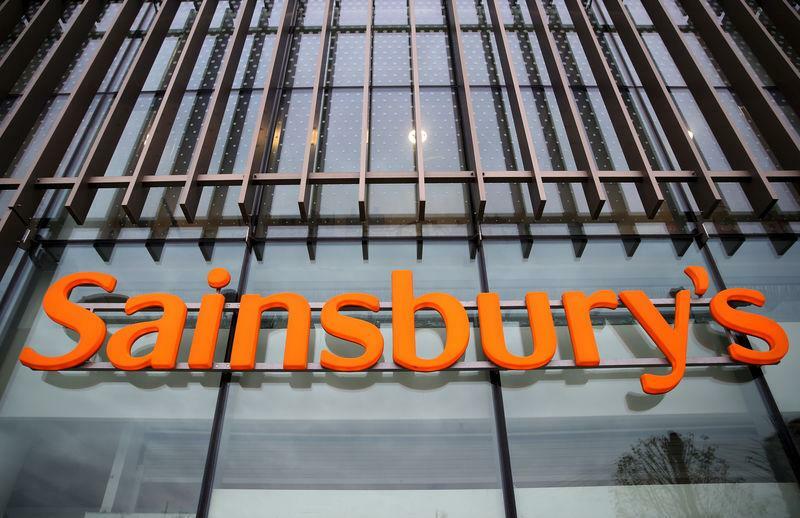 By joining forces, Sainsbury and Asda aim to take on German-owned discounters Aldi and Lidl, whose UK sales rose 10 percent and 5.4 percent respectively in the 12 weeks to Feb. 24, according to the Kantar data, taking their combined UK market share to 12.8 percent. Kantar said all of Britain's big four supermarket chains lost market share to Aldi and Lidl. The researcher also noted that one in 10 shoppers claim to have started stockpiling food to prepare for a no-deal Brexit, with a further 26 percent reporting that they are considering doing so, echoing data also published on Tuesday from Barclaycard. However, Kantar said "this has not been borne out in sales just yet." "Overall grocery volumes rose by 1.2 percent in the four weeks to Feb. 24, no increase compared with recent months, and it’s worth noting that hard-to-stockpile fresh and chilled foods made up 39 percent of the value of the average British shopping basket," said Fraser McKevitt, head of retail and consumer insight at Kantar Worldpanel. The market researcher said average prices of grocery goods, which cover all items sold at UK supermarkets, rose 1.4 percent in the 12-week period from a year earlier. They had risen 1.3 percent in the previous data set. Kantar said prices rose fastest in markets such as cola, crisps and vegetables. Easter supermarket opening times: When are Tesco, Asda, Aldi and Sainsbury's open this bank holiday Monday?